Everyone wants to be a bit greener these days and refilling your inkjet cartridges is one way of doing just that. But refilling them can lead to problems with print quality and cartridge life. This post talks you through some of the most common problems and tells you how to get round them so you and your inkjet cartridges can live a long and happy life together. Inside inkjet cartridges (with a built-in print head) is a foam sponge. If wait too long to refill your cartridge you run the risk of this drying out. The sponge will go hard and ink dries and clogs the micro holes of the printer head. This will result in inconsistent light and dark print and a reduced number of prints per refill. To avoid this, refill your cartridge as soon as it’s out of ink or, preferably, top it up after every 200-250 sheets to make sure it always has ink and that the sponge can’t dry out. Place half a cup of hot tap water and bleach (50/50) in a saucer or shallow dish. Hold the print head of the cartridge in the solution for 2 –3 minutes to hydrate and loosen any dried ink and allow the ink to flow through the print head nozzles. Once cleared you should see ink bleed out (gently wipe it dry) – repeat if necessary. It’s best to do this with an empty cartridge. 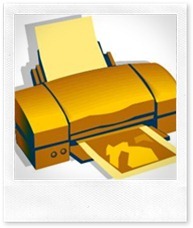 Once cleaned add a small amount of ink to the cartridge to test the print quality. 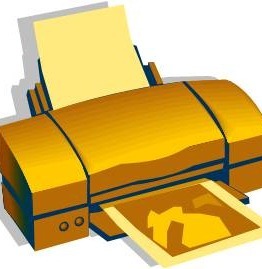 Then insert the cartridge into the printer and run it through its print head cleaning cycle. By keeping the print head clean you will increase the possible number of successful refills. Gently clean the print head with a soft cotton cloth or cotton bud (don’t use tissues) dipped in water. Then snap the cartridge in and out a few times to get a good connection. When you’re filling a tri-colour cartridge the last thing you want to do is put the wrong colour in the wrong chamber. To avoid this, get 3 tooth picks and dip them into the chambers – deep enough to pick up some of the ink. Then when you know which chamber holds which colour, mark the cartridge accordingly so you don’t make a mistake. It is important to give your cartridge chance to get some ink flow after cleaning. So, once you’ve completed a cleaning cycle print 3 or 4 pages of a colour image. If it’s still not looking great repeat the cleaning cycle and then print a few more pages. Keep doing this until you get a good quality print. The purging cycle isn’t the same as the cleaning cycle (if you don’t know how to do it read your printer manual). Basically during the purge cycle, all the jets in the cartridge are heated and then cleaned from the inside out. Resistors (they control the current to each outlet jet) are the reason behind a cartridge’s limited refill life. If your cartridge runs out of ink, the resistors can overheat and then they’ll burn out and fail. The result is wavy, slanted print. If this does happen the only thing you can do is ditch that cartridge and buy a new one. Refilling ink cartridges can change the equilibrium inside them and may therefore need time to adjust. Some require you to re-pressurise them using a plastic squeeze bottle which blows air into an air hole. Others just need to be allowed to sit for a while before they can be re-inserted into the printer. Some sponge filled cartridges can develop air pockets at the bottom of the cartridge block the flow of ink. Centrifugal force is the answer. A spot of ink should be visible from each chamber. If not do it again. General maintenance, such as the steps above, will help extend the life of your refillable inkjet cartridges.